Where do I use my Disneyland Paris voucher code? "Sign up for exclusive offers, benefits and deals." "Find great discounts and packages in the offers section." With two gigantic theme parks - the Disneyland Park (styled after the classic Disney tales adored by children around the world for decades) and the Walt Disney Studios Park (a fascinating and thrilling adventure through the world of movies, where there’s dozens of attractions for the whole family), Disneyland Paris offers fun and thrills for every age group and Disney fan. As well as impressive rides and rollercoasters like the Big Thunder Mountain Railroad roller, the Rock’n’Roller Coaster, and the Pirates of the Caribbean boat voyage, you can meet your favourite Disney characters, enjoy world-class meals in the various restaurants, bars and diners and enjoy spectacular parades and firework displays. For those of you looking for a more low key getaway you can choose to relax in the Disney spa, enjoy a range of sports including golf and tennis, catch a movie at the IMAX cinemas, indulge in a magical live show or explore the wonders of the ocean at the SEA LIFE aquarium. Choose from many destinations in the Disneyland Park including the Disney Village and the Les Villages Nature Paris and tailor make your magical holiday to suit you. Stay at a Disneyland Paris hotel and fully immerse yourself into the out of this world wonder that is Disney. Choose from an array of stylish and themed hotels such as the luxury Victorian Inspired Disneyland Hotel or the rustic and charming Davy Crockett Ranch and step on and off the Disney Park in seconds, making your stay even more magical, hassle free and fun. You can also opt to stay at Disney’s Hotel New York, the Newport Bay Club, Disney’s Sequoia Lodge, the Hotel Cheyenne or the Hotel Santa Fe. And, there’s also tons of partner hotels to choose from in locations in and around the resort including the Vienna House Dream Castle Hotel, the Radisson Blu Hotel, the B&B Hotel and the Hotel Elysee Val d’Europe. These partner hotels are great for those of you travelling on a budget or simply if you want to escape the chaos of Disney after a long day on the parks. And with the Paris City right on your doorstep, with these hotels you have the option to explore the most glamorous city in Europe. Travelling to Disney can be an expensive job, and once you reach the park the spending doesn’t stop. Disneyland Paris understands this and aspires to provide affordable prices on tickets, hotels and activities so that children and families of all backgrounds can enjoy the magic of Disney. Many of these affordable prices can be found in the offers section on the Disneyland Paris website. Updated every week, the offers section provides great deals on package holidays, seasonal breaks and for those of you looking to book in advance, with up to 45% off a number of magical breaks. For updates on the latest Disney deals and special offers make sure you sign up to the newsletter on the website. Please call 08448 008 898 to contact Disneyland Paris customer services. What if someone in my party has a disability, illness or allergy? If you have any specific queries about bookings and stays for guests with disabilities or food allergies, please use the form available here. Can I pay a deposit on my holiday? 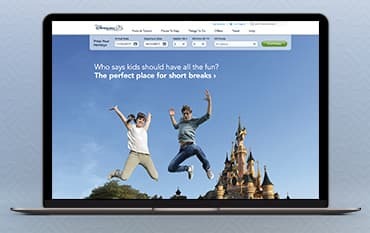 Yes, you can pay a 15% deposit on your Disneyland Paris holiday. You wont have to pay the rest of the balance up until 30 days before your arrival date. Disneyland Paris continues to be a place of magic and wonder with incredible scenery, attractions and rides that are updated and improved every year. A place where all your dreams come true; Disneyland Paris caters for children of all ages as well as every generation of adults with fantastic experiences, fine dining opportunities and adrenaline pumping rides based on all your favourite Disney movies. Explore the world famous Cinderella Castle, transform into your favourite princess or superhero, blast off to a galaxy far, far away, test your nerves on a daredevil ride and enjoy thrills and fun in the Tower of Terror. Book this holiday of a lifetime online at Disneyland Paris and make sure you use a discount code from us to save money on your visit to the magical kingdom. We are constantly on the hunt for Discount Codes for Disneyland Paris to help you with your money saving. Our experts check dozens of sites for secret codes including NHS discounts, student sites & social media channels saving you time & money!